Milk is a nutritive beverage obtained from various animals and consumed by humans. Most milk is obtained from dairy cows, although milk from goats, water buffalo, and reindeer is also used in various parts of the world. In the United States, and in many industrialized countries, raw cow's milk is processed before it is consumed. During processing the fat content of the milk is adjusted, various vitamins are added, and potentially harmful bacteria are killed. In addition to being consumed as a beverage, milk is also used to make butter, cream, yogurt, cheese, and a variety of other products. In 1863, Louis Pasteur of France developed a method of heating wine to kill the microorganisms that cause wine to turn into vinegar. 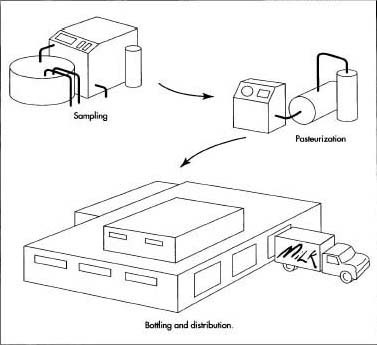 Later, this method of killing harmful bacteria was adapted to a number of food products and became known as pasteurization. The first milk processing plant in the United States to install pasteurizing equipment was the Sheffield Farms Dairy in Bloomfield, New Jersey, which imported a German-made pasteurizer in 1891. Many dairy operators opposed pasteurization as an unnecessary expense, and it wasn't until 1908 that Chicago became the first major city to require pasteurized milk. New York and Philadelphia followed in 1914, and by 1917 most major cities had enacted laws requiring that all milk be pasteurized. One of the first glass milk bottles was patented in 1884 by Dr. Henry Thatcher, after seeing a milkman making deliveries from an open bucket into which a child's filthy rag doll had accidentally fallen. By 1889, his Thatcher's Common Sense Milk Jar had become an industry standard. It was sealed with a waxed paper disc that was pressed into a groove inside the bottle's neck. The milk bottle, and the regular morning arrival of the milkman, remained a part of American life until the 1950s, when waxed paper cartons of milk began appearing in markets. The federal Food and Drug Administration (FDA) establishes standards for different types of milk and milk products. Some states use these standards, while others have their own standards. Prior to 1998, the federal standards required that fluid milk sold as whole milk must have no less than 3.25% milk fat, low-fat milk must have 0.5-2.0% milk fat, and skim milk must have less than 0.5% milk fat. Starting in 1998, the FDA required that milk with 2% milk fat must be labeled as "reduced-fat" because it did not meet the new definition of low-fat products as having less than 3 grams of fat per serving. Milk with 1% milk fat could still be labeled as "low-fat" because it did meet the definition. As a comparison, light cream has no less than 18% milk fat, and heavy cream has no less than 36% milk fat. The average composition of cow's milk is 87.2% water, 3.7% milk fat, 3.5% protein, 4.9% lactose, and 0.7% ash. This composition varies from cow to cow and breed to breed. For example, Jersey cows have an average of 85.6% water and 5.15% milk fat. These figures also vary by the season of the year, the animal feed content, and many other factors. 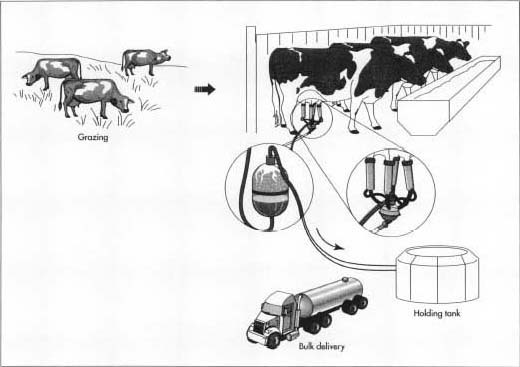 Dairy cows are milked twice a day using mechanical vacuum milking machines. The raw milk flows through stainless steel or glass pipes to a refrigerated bulk milk tank. a few hours of being collected. In the United States, there are several hundred thousand dairy farms and several thousand milk processing plants. Some plants produce only fluid milk, while others also produce butter, cheese, and other milk products. 2 A refrigerated bulk tank truck makes collections from dairy farms in the area within a few hours. Before pumping the milk from each farm's tank, the driver collects a sample and checks the flavor and temperature and records the volume. 9 The milk is pumped into coated paper cartons or plastic bottles and is sealed. In the United States most milk destined for retail sale in grocery stores is packaged in one-gallon (3.8-liter) plastic bottles. The bottles or cartons are stamped with a "sell by" date to ensure that the retailers do not allow the milk to stay on their shelves longer than it can be safely stored. 10 The milk cartons or bottles are placed in protective shipping containers and kept refrigerated. They are shipped to distribution warehouses in refrigerated trailers and then on to the individual markets, where they are kept in refrigerated display cases. 11 To ensure sanitary conditions, the inner surfaces of the process equipment and piping system are cleaned once a day. Almost all the equipment and piping used in the processing plant and on the farm are made from stainless steel. Highly automated clean-in-place systems are incorporated into this equipment that allows solvents to be run through the system and then flushed clean. This is done at a time between the normal influx of milk from the farms. Giblin, James. Milk: The Fight for Purity. Thomas Y. Crowell, 1986. Hui, Y.H., ed. Encyclopedia of Food Science and Technology. John Wiley and Sons Inc., 1992. Kroschwitz, Jacqueline I. and Mary Howe-Grant, ed. Encyclopedia of Chemical Technology, 4th edition. John Wiley and Sons Inc., 1993. McGraw-Hill Encyclopedia of Science and Technology, McGraw-Hill, 1997. Dairy Farmers of Ontario. http://www.milk.org . International Dairy Foods Association. http://www.idfa.org . National Milk Producers Federation. http://nmpf.org . Fresh milk is also referred to as full fat milk or whole milk. Despite this, fresh milk is a low-fat food. It is also a good source of calcium. One pint of milk per day will provide children and adults with three-quarters of their calcium needs. Calcium is needed at all ages for bone health. Low-fat milk contains half the fat of whole milk. It is popular with people who are watching their weight or who are trying to reduce their fat intakes. Low-fat milk is not suitable for children under two years. Low-fat milk is sometimes fortified with vitamins and minerals because reducing the fat content in milk also reduces the levels of vitamin A and D. These vitamins and others such as B vitamins are added back in. Different dairies add different vitamins at varying levels so it is important to read the labels on milk cartons so you know what you are buying. Low-fat milks with added vitamins have a unique composition compared to ordinary low- fat milk. LGG is a â€˜friendlyâ€™ probiotic bacteria, which is reputed to help aid digestion. When did companies start producing and distributing 2% milk? What are the health impacts (positive or negative) of Permeate if any. Where are they published. How is chocolate made?How is chocolate made?How is chocolate made?How is chocolate made?How is chocolate made?How is chocolate made?How is chocolate made?How is chocolate made?How is chocolate made?How is chocolate made?How is chocolate made?How is chocolate made?How is chocolate made?How is chocolate made?How is chocolate made?How is chocolate made?How is chocolate made?How is chocolate made?